Marking Hyundai’s entry in the sub-4-metre SUV segment, the Venue is positioning itself to be a game changer. We already know it is going to come with a first in segment connectivity feature. 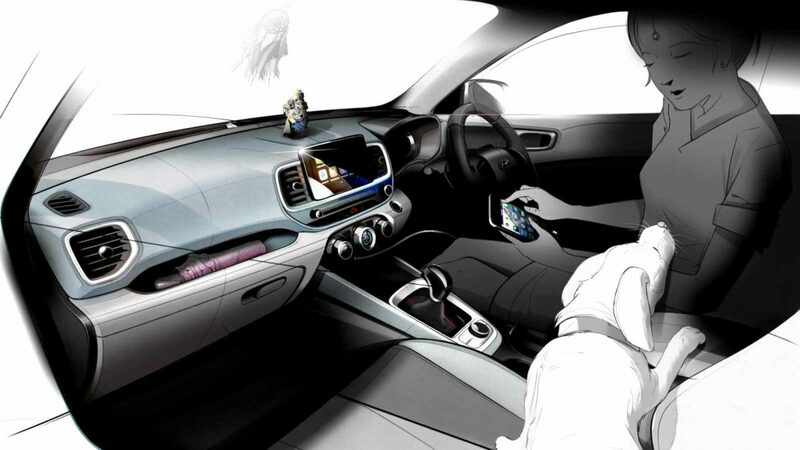 Powered by BlueLink technology, one can access as many as 33 different functions of the vehicle through this technology, including car sharing, GPS tracking and much more. The Korean brand has now shown us some design sketches of this upcoming SUV, and with looks like that, the Venue sure is the place to be. 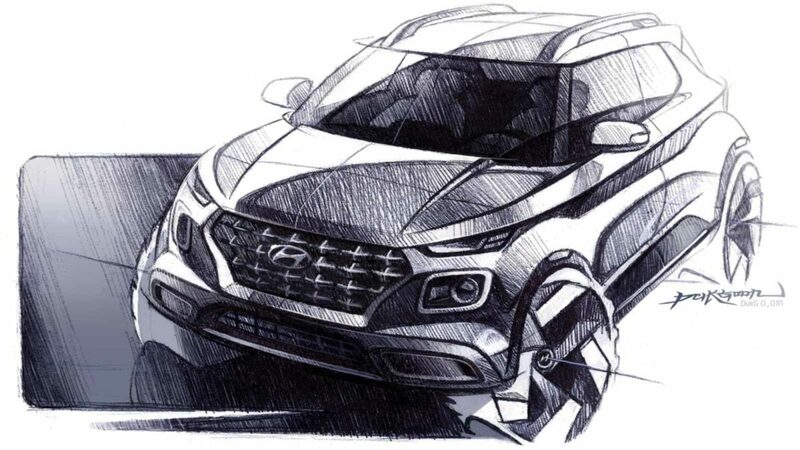 Although leaked photographs and teasers have already revealed quite a few details of this Hyundai, one can get a fair idea of what is in store by looking at these sketches. The front fascia of the Venue will make a huge impact with its blingy cascade grille and the square-shaped DRLs. The bonnet is surrounded by sleep headlight assemblies on both top edges, which looks rather futuristic. Two lines can also be seen on the bonnet, adding more to the muscular character of the car. One can also see the presence of plastic cladding all over the bottom half of the car, following the wheel arch as well. One can also see a small crevice in the wheel arch, which probably will hold a reflector. Things are equally interesting at the rear as well. One can notice how the tailgate has been squeezed in, very similar to like in the Grand i10, for a nice appearance. The car also seems to receive a floating roof effect. On the inside, one can see a floating type screen which would offer a bunch of connectivity options. One can also spot a round dial with 4 buttons surrounding it, very similar to what Audi provides, for controlling the infotainment screen. There is also some space carved out above the glovebox for you to place some essential, small items. The Venue too, will come with a flat area in the centre of the dash for us Indians to place our idols. If you look at the steering wheel closely, you could also spot what appears to gear shift paddle, suggesting the sporty 1-litre motor with the 7-speed DCT would come with paddle shifters, a first in class feature. Do have a look at these images and stay tuned for more news on the Venue which would be previewed in India on the 17th of April, 2019.